National Park and Recreation Month fun continues! 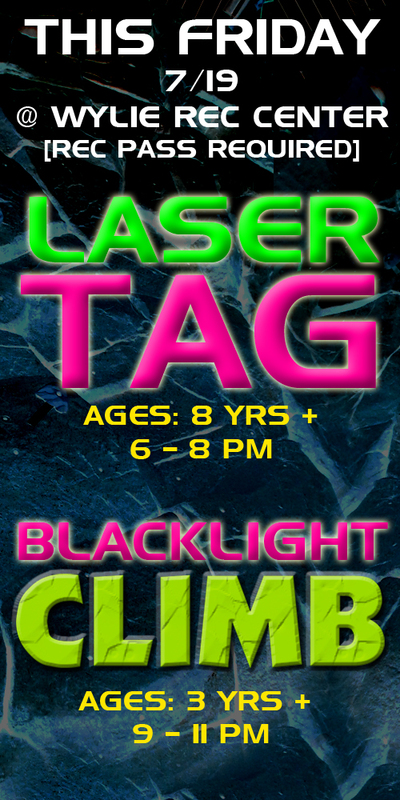 This Friday 7/19 - Laser Tag, Food Trucks and Blacklight Climb at Wylie Recreation Center. Laser Tag starts at 6 pm and is going on until 8 pm. The food trucks are back at 6:30 pm. Then Blacklight Climb runs 9 pm - 11 pm. Don't miss it! The food trucks include My Cupcake Garden and Sweetie V's Food Truck.